Presenting the song Mujhe Kaise Pata Na Chala Lyrics by Papon. The song is composed by Meet Bros and lyrics has been penned by Kumaar. Listen to the song on Gaana. 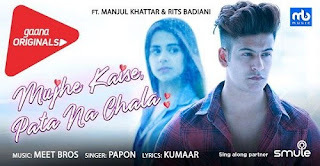 Mujhe Kaise Pata Na Chala Lyrics is sung by Papon and music is composed by Meet Bros while lyrics are beautifully penned down by Kumaar.